Together you must face the horrific dangers that wait in a dark and forbidding dungeon. This dungeon-bash game by Games Workshop (from back in the 90s) commands very high prices on eBay these days. 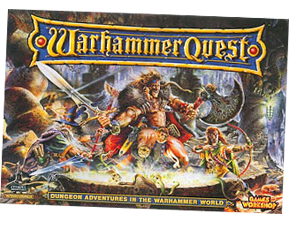 I’m not sure why as it’s pretty basic, and was the last in a line of dungeon adventuring games that progressively got simpler and more targeted towards selling miniatures. The included ‘Roleplay Book’ isn’t really roleplaying, but a basic set of campaign rules with many tables for in-between dungeon mucking about. Possibly because of its very simplicity—and therefore expandability—there is a dedicated and passionate community of fans out there. For an example of fandom taken to glorious heights, check out Warhammer Quest: Beyond the Grey Mountains, a beautiful website that features a series of campaign videos, lots of extra content and a growing community for the game. I would not have guessed the rules for this game would fit on 1 A3 page! Good job! I think you may have your A3 and A4 mixed up – this page is 275x200mm, less than A4 in size. and what about new release by FFG? I liked look of it. Always end up with cash given to me by someone at Xmas, so ordered it so that someone can buy it for me and I can have something new to play after the excessive food on the 25th.